Is this the greatest British painting of the nineteenth century? Historian Simon Schama thinks so, and makes a pretty solid case, too, in his series "Simon Schama's Power of Art" (originally aired last October and November on BBC Two and now airing in the United States on PBS). 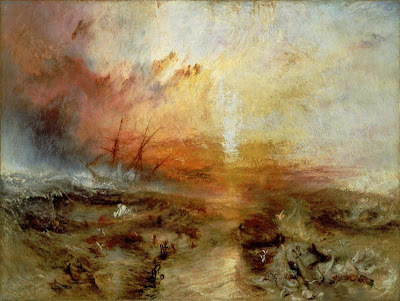 This is JMW Turner's Slave Ship (Slavers Throwing Overboard the Dead and Dying, Typhoon Coming On) from 1840. (Click on the image for a larger version.) John Ruskin once owned this oil painting, which is now in the collection of the Museum of Fine Arts, Boston. It measures 90.8 x 122.6 cm (35 3/4 x 48 1/4 inches). The painting was based on a poem that described a slave ship caught in a typhoon and on the true story of the slave ship Zong, whose captain, Luke Collingwood, had (in 1781) thrown sick and dying slaves overboard so he could claim compensation from his insurers for lost "cargo." A replica of the Zong was sailed up the Thames in March 2007 as part of the UK's national commemoration of the bicentennary of the abolition of the slave trade. GrahamIX has some nice shots at Flickr. "In 1840 in London, an international convention of the Great and Good was planned to express righteous indignation against slavery in the United States. Turner, initiated into the cause many years before by his patron, Walter Fawkes, wanted to have his say in paint. So how does he do it? By being a thorn in the side of self congratulation. "He reaches back 60 years to resurrect one of the most shameful episodes in the history of the British Empire, when 132 Africans - men, women and children, their hands and feet fettered - were thrown overboard into the shark-infested waters of the Caribbean. And Turner has drowned you in this moment, pulled you into this terrifying chasm in the ocean, drenched you in this bloody light - exactly the hue you sense in your blood-filled optic nerves when you close your eyes in blinding sunlight. "Though almost all of his critics believed that the painting represented an all-time low in Turner's reckless disregard for the rules of art, it was in fact his greatest triumph in the sculptural carving of space." So...is this the greatest British painting of the nineteenth century? If not, what painting would you nominate instead? good description and i think it IS the best painting from that time. H.